Encounter the thrilling ride of this amazing water slide all while riding the wave through a slippery curve and bump before splashing into the pool. 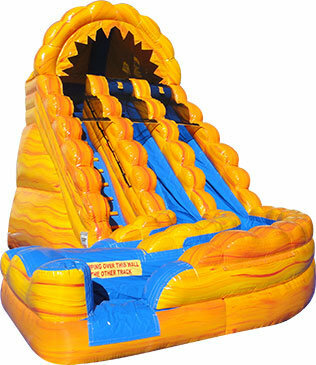 This 20' High Wild Rapids Dual Water Slide with Pool will be the talk of your next event. With the two lanes you are able to race down the cool rapids with your friends, team-mates or co workers. Beat the Heat and long lines at the water park with your very own water slide rental.